Thanks for detailed and insightful information. I really wish this would make it to some of Hoya / Pentax decision makers. Right now I`m going to crosspost a link to this post on to the Ned Bunnell blog. I hope you appreciate this list of patents. I agree, Pentax should give consumers a road map for plans for a full-frame camera offering. This would be especially helpful for all photogs, whether Pentaxian or potential Pentax users. 5.) **Brand loyalty…maybe. The K20D was my first DSLR. Everyone in my degree program had to switch to digital from film. Therefore, why switch to a different brand if my lenses were backwards compatible? The K20D could also sync with studio equipment. FF is a nice to have, but not that importan from my point of view. A thought'provoking article. Personally, I am interested in a full-frame upgrade (I still treasure my Pentax A Macro 200mm lens) and also a waterproof camera with better image resolution. I use an Optio W30 and have not upgraded because I am not convinced about improved image quality with the newer models. I hope the Pentax engineers and planners take notice. Thanks for a most interesting article. My point of view, and s that the quality and magic of a photography goes beyond the type of used camera, if it is of the high low range or. But it is certain that PENTAX like company, must watch after their future and technology, and have references of the competition Canon, Nikon if wants to matnener quota of market…. A body Full Frame would be very interesting and good to give to force to its market and image of mark. Do we really need FullFrame? It is just a marketing foul! Remeber the arguments of Nikon bevor the d3s (end 2007). They where right. Aps-C is even better, wenn u use ff-lenses. your list of patents is impressive. Thanks for sharing. I mentioned 300 and 60-250 in particular because this is recent (Hoya era) work and it isn't APS-C.
We only need a good beer, right? But it's no marketing foul, trust me. If Pentax is to not be an also-ran in the mirrorless market they would have to do something distinctly if not radically different from other companies. I have wondered if it would be possible from an engineering perspective to retain full compatibility with the K-mount in their mirrorless camera whilst still supporting a new type of more compact lens specifically for their mirrorless line. Jerryrigged systems of expensive and semi-functional adaptors don't enthuse photographers. A mirrorless camera with full native access to a dSLR lens system would. It'd be nice to see the new quasi phase detection SuperCCD in such a camera (so long as it's without the quality-killing EXR gimmick). Frankly, I doubt that Pentax has an interest in a FF camera. I was a part-time pro working with Pentax film equipment and tried unsuccessfully to find support within the Pentax corporation for their professionals. Nikon and Canon at least support their pros. I've tried the Pentax digital cameras and they don't compare to the full frame or the better APS-C in terms of image quality. They aren't bad, but they don't have the edge they need and there is still no support for pros. Move to Canon or Nikon if you aspire to achieve your full potential. "to achieve your full potential"
I'm sure that Pentax will try to deliver a product or innovation which will allow you to achieve your full potential at Photokina 2010. But what shape or form this product is going to have I dont know. There is one other market segment that has a need for an affordable FF: the panoramic photography market. The current method of choice for most professional panographers (those making their income from it) is a full frame DSLR and a 10-17 Zoom Fisheye DA (Tokina or Nikkor) with the lens hood shaved off. This gives a > 180 degree field of view and has excellent quality outside the APC sensor boundaries as well as adequate resolution for output with only 3 images needed for a stitch. Pentax has that lens already-it is the same lens as the Tokina and Nikkor. An affordable FF would allow pentax into the Pro-Pano market without any lens production needed. @everybody ... please, leave a name or avatar when posting anonymously. It's a question of netiquette. Interesting comments. BTW, I *know* Pentax has an interest in FF when affordable enough. The comment about mirrorless: I didn't touch on that. But my recommendation to Pentax would be to make the mirrorless mount such that the FF image circle fits (like for Sony's E-mount) and to provide a K-mount adapter with good AF support (the early mirrorless cameras all would be APS-C of course). Contrast AF can be as fast as phase AF, even with legacy glass, provided a good algorithm and CPU are deployed (and a sensor with support for region of interest readout). Full support for legacy glass in a mirrorless is a technical problem which can be solved. If Pentax wants that or can invest enough research is another question. Sorry, just re-posting this comment because of a few stupid mistakes in the original version. Once more, you've hit the nail right on the head. Here's a point or two I'd like to add. First and foremost the viewfinder. I'm sick of APS-C viewfinders, never mind if they're 0.85 or 0.89 and 100 % or not. They're rotten. The lot of of them. Oh, and once we're at it - please Pentax give us a decent high-eyepoint VF. The proportion of people wearing eyeglasses rises by the day and we've had enough of the eyeball gymnastics required to see the complete frame *and* the exposure info below it. It worked with 35 mm, so let's have it back. In my view, we wouldn't even need that much more MPix. Make it 18 or so and then use the remaining real estate to make bigger photosites for more dynamic range and less noise. Far more useful than driving the pixel count to extremes which are more of a burden in postprocessing instead of doing much to improve actual image quality. Lastly, there's a lot of people who've built up a heap of Pentax lenses and accessories over more than a decade and they're feeling left out in the cold and rain of APS-C. I'm one of them. I'd hate to lose a lot of money by selling all my glassware and buying into another system. But the K-7 has been my last APS-C purchase. Ever. Just to prove your point a bit more. I love Pentax and never thought I would outgrow it but recently I have found that when trying to sell my services as a model photographer that an APS-C does not cut the mustard. I am at the point of now selling all 25 of my lenses and 3 DSLR bodies to invest in a FF canon. Ive got my fingers crossed!!! Thanks for your recommendations to Pentax and the thorough reasoning behind them. I agree with some, but not others (and that's just fine) but I do wish you'd expand on one particular point: You say that Pentax should announce/release the K-5 (an upgrade of the K-7) and announce their FF plans at the upcoming Photokina. Here's my question: If FF really is that important to current Pentaxians, don't you think that its announcement would kill sales of the K-5? If all the advanced amateur Pentaxians are so desperate for a FF camera, then what's the point of the K-5? If they know a FF DSLR is coming in 2011 then they'll stick with their K-7's until then, or if they're K10/20D users then just buy a K-7 for $800 now to tide them over while they wait. Why would any of these desperate FF Pentaxians purchase a K-5? And if they don't purchase a K-5, who will? 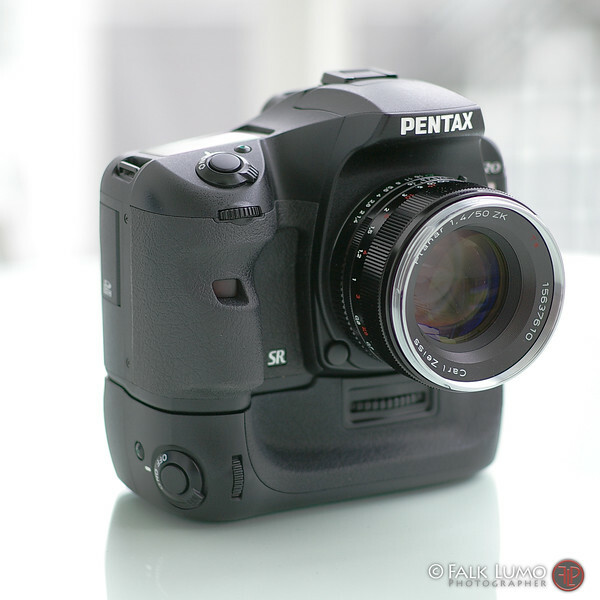 And if the K-5 is a flop, then how does Pentax make a profit? Pentax is neither Canikon, nor Sony; they can't afford to have their flagship camera be a flop. Or any of their cameras, for that matter. May I ask you what is the DSLR in the picture ? you make a very valid point and I avoided discussing it in the (already long) article. You're right, normally to stay silent about forthcoming products which aren't for sale yet is the best strategy. And it is certainly the reason why Pentax has sealed lips on the matter. There is one exception though and this is when the product is a system actually and any purchase is a decision beyond the single product. Examples are an operating system (Mac or Windows...), a camera system, anything with a steep learning curve (like 3D modelling software) etc. Products which make you invest into an ecosystem. In such a case, the vendor must assure that its ecosystem is healthy and make certain assertions about future developments. Otherwise, I go for another ecosystem with a clearer development path. Uncertainty is like poison in this situation. Back to your example. Assuring that Pentax has a healthy full frame roadmap and starting to release full frame lenses would actually make more people buy the K-5 than in the opposite case. Because K-5 is a good means to invest in a future-proof system again. Full frame lenses would work on the K-5 like a charm (think about the great DFA 100 Macro) and buying the K-5 may be a wise step to skip the firest full frame and jump onto the second next when full frame is more affordable. A strategy I would recommend and many would consider. K-5 would be a good purchase for K10D and K20D owners. If full frame is coming and the ecosystem has a bright future. My fear actually is that K-5 won't sell because nobody wants to buy more APS-C lenses or further invest into an ecosystem with uncertain roadmap. Nobody really wants to end up in a situation like that of Olympus FourThird SLR owners with a selection of expensive glass now. Pentax has to make clear it won't happen with them. it is a K20D with the "fat" grip which was available as a custom-built option or after-sale modification in Germany and Japan. Thanks for your quick reply, Falk. I suppose we'll find out which way it's going to be in a few weeks. But if a FF is announced, I would demand that everyone begging for it on the forums purchase it. I don't think it's in Pentax's best interest for you to recommend that people skip the firest full frame and jump onto the second next when full frame is more affordable. One thing I've proposed in the past is that Pentax set up a pay-up-front ordering system: Via an official Pentax page you place a pre-order for a FF Pentax for, say, US$2,000. There is a list of specs for the camera, and the money is charged to your card upon checkout. This amount is non-refundable as long as Pentax makes, say, 5,000 sales. Pentax's part of the deal is to guarantee a FF camera will be released within 1 year of them reaching the 5,000th sale. Of course, once the camera is released, the first 5,000 units will go to those who preordered it. This sale method would make everyone on the Pentax fora put their money where their mouth is, and would also guarantee Pentax the minimum number of buyers they would need to break even on the FF project (as such, this number might be above or below the 5,000 units I pulled out of thin air). In my opinion, if Pentax were to make a full frame DSLR, the size of a K7 and implement a fast LV focusing system, without the flip flop mirror action, there were would be no need for them to even bother with SLD type cameras. I have been waiting since the 1990's for a "coat pocket sized" full frame DSLR, like the K1000, FM2, OM1 etc., to keep a small prime on and I think a lot of others have been waiting as well. If the price was kept under 2K dollars, I think it would sell very well. The SLD fad is going to wain when people get tired of no viewfinder as I did with the GF1 and moved to a GH1. However, I would just as soon use a small DSLR with an optical viewfinder, if it had a similar Live view implementation. Live view is great for a lot of different things, but an optical viewfinder is great for times when I need critical focus. @Misere, in my article, I write that pentax will not release a FF camera and doesn't even plan to talk about their agenda. Pentax has said recently that it is working hard to fill out its product line or plug the gaps in its product line. Not in these exact words of course. To me, it is Pentax finally seeing the writing on the wall. It now knows that unless it works night and day on a full frame model, it is going to retreat into the mirrorless camera body business just like Olympus. In fact, I predicted it years ago. APS-C only is an insane strategy. The APS-C format promises but never delivers smaller bodies or lenses. Nor are the APS-C only lenses any cheaper or smaller. The mirrorless cameras finally deliver what the APS-C format promises, so it is do or die for Pentax. Release a full frame and mirrorless models or see its APS-C only camera business wither away. I have been waiting since the 1990's for a "coat pocket sized" full frame DSLR, like the K1000, FM2, OM1 etc., to keep a small prime on and I think a lot of others have been waiting as well. If the price was kept under 2K dollars, I think it would sell very well. I'm with you on this. I've written a number of times about my desire for an LX-D; not "in essence", but an actual camera with an LX body and a digital sensor inside. I would even be happy with APS-C, but if it had a FF sensor with great low-light performance (like a D700 or D3s) I'd be happy too. I agree with the above. Whether APS or FF, it would be nice to see Pentax release a "coat pocket" SLR. Pentax primes are generally slower than the competition, but users get smaller sizes and better build quality in return. The pancake lineup would fit perfectly with a small, hip-looking SLR. The metal and pleather look of the old film SLRs would be a great starting point for the design of such a camera. An interesting idea I think would be to get the price point down on the 40mm pancake and bundle it with the "pocket camera" as the kit lens. Even if it is not a huge seller, the combination would be unique and generate a lot of positive publicity for the brand in general. Ultimately I do think that Pentax needs a full frame camera. Whether or not FF makes for better pictures, the bottom line is that enthusiasts are not going to keep shelling out $1300-$1500 every few years for APS cameras when FFs are priced only slightly higher. If Pentax does not address this, they will be left out in the cold. A good lineup from my point of view would be a mirrorless entry-level camera, an "lx-d" APS SLR, a more full featured APS SLR, and a FF SLR in the same space as the D700 or 5D. Throughout this lineup Pentax can emphasize their uniqueness with smaller sizes, better build quality, weather-proof bodies/lenses, backwards compatibility, and in-camera shake reduction. They can position the brand as the antidote to the giant camera/giant zoom-lens space that Canon and Nikon comfortably occupy. Thank you. A very well-thought-out, well-written and balanced presentation. As I said at the outset, this is an insignificant concern compared with the demand for better high-ISO performance and video capabilities. But if Pentax doesn't offer some assurance that a FF camera is in the pipeline, it will be the reason this longtime Pentax loyalist ultimately abandons the brand in favor of Canon. @Jon, yes, legacy glass Pentaxians would like to see a full frame Pentax. They typically ask for uncrippling the K mount too, a feature known as "blesator" in the German Pentax community. However, "blesator" is synonymous to a running joke now. And Pentax is not happy that legacy glass sells well while some newer DA glass does not. So, one must be cautious here or the argument turns against you. Pentax can have a unique selling point with respect to Olympus, Canon, Sony, even (to a lesser degree) Nikon: That Pentax acknowledges the investment done by any Pentaxian into glass, be it in the past or (and that's the important bit here!!) be it in the future. That Pentax will provide for the best possible protection of investment. As you say, such claim would be credible. But with just a couple of minor mistakes now, the credibility may be lost forever. Currently, the most credible player when it comes to protection of investment is Leica. And they are doing better than ever. A pro user has no problem to invest into expensive glass. It will pay off by the next couple projects. An enthusiast though can only invest into (expensive) glass if the future of the system is known. I am sure Pentax sees this simple logic at work already today! We are seeing a moment of change in digital photography: SLD mounts emerge and FF returns. Most refrain from expensive lens purchases in such a climate. Pentax can make a big splash by committing to preserve the value of investments into their lenses. However, this cannot work without committing to full frame in the long term. Thank you so much for your comments - they're most insightful. You're absolutely right, of course: the legacy-glass argument for FF could be counterproductive, if it suggests to Pentax that people may buy a FF body without making a commitment to purchasing new lenses for it. From my perspective, I see the release of a FF body as a way to make both old-lens and new-lens users happy. Look at it this way: old-lens users are also new-lens buyers. If I've migrated to Canon principally because the FF format allows me to use my old Pentax lenses without dealing with the crop factor, then the overwhelming likelihood is that any new lens purchases I make will be investments in the Canon system. So if Pentax's silence on the FF question induces me to take my old lenses elsewhere, then it loses not only a FF body purchase, but also any future new-lens purchases. So in this case, acting in a way that honors the brand's past would also help to protect the brand's future. Jon brings up a good point regarding legacy glass. If there is one thing that would sway me towards a FF Pentax purchase (apart from better low light performance) it would be a camera with an uncrippled mount. The Nikon D700 has such a mount and allows its users to use rather old Nikkors with full automation (except AF in some cases). Jon wrote: That tells me that there's still a very real, deep commitment at Pentax to its legacy lenses. Yes and no. I want to point out that A-like use of K and M lenses can be achieved via firmware, without need to physically change and decripple the current mount. If Pentax hasn't implemented this it's because they don't want to. This tells me their commitment is not deep, but shallow. Yes, it's better than most other brands (e.g. Sony users don't get image stabilisation with older 3rd party lenses while Pentaxians do) but it could be a lot better. Pentax has a strong "support legacy Pentax gear" and "don't support 3rd party legacy gear" policy. There are plenty of optically great M lenses that I have not bought because I don't want to deal with the Green Button. I know me buying M lenses doesn't make Pentax any money, but having mountains of M lenses out there that can be bought at decent prices might very well entice people to buy an uncrippled body. And once they have the body they might (will!) be enticed into buying some nice new lenses for it. This is a pretty poor article that sounds more like reasons why the author wants a full frame body from Pentax rather than any real, solid reasons why it should be of any benefit to everyone else. I could easily sit here and discount most of the arguments made in favour of a full frame sensor, and most of the "facts" are dead wrong too. As someone who would be interested in a full frame body, I think this article actually hurts our cause more than anything else. Thanks for this article. I totally agree with the need of having a FF roadmap for Pentax to not loose experimented photographers as clients. -two, if the client is a little bit interested in photo, he will quickly see (know) that your camera is not FF and so imagine (in a wrong way) that you will not provide photos as good as if you were shooting with FF! It is hard to say, but here is the reality! Working with a Pentax, it is like driving a Volkswagen with full option instead of a Basic Options Mercedes or BMW. Better price vs options, same engine but do not have the same impact on the general public! I still love my Pentax Lenses but will have to move on if no FF is announced for 2011! It's really pitty that Pentax didn't come with an ff every year there are the same rumors and there is still none. I totaly agree with Stephane! I do not want an FF camera from Pentax (for me). I do not need one. I am interested in capabilities, not in technical specs. If the low-light capability (high ISO) is considerably improved by whatever means, I am satisfied (and have invested in APS-C lenses from Pentax). But I *do* want Pentax to bring out one, as so many people seem to need it. And I'd like to see Pentax to be successful in the market, with a much larger market share. Well, the second patent is about the super zoom and old news. DA 16-20mm f/4 APS-C zoom lens it I doubt it would be produced. @Kolding, that's easy. Just read the tables in the patent. They list the focal length 'f' and image half angle 'W'. 2f tan(W) is the image circle and it is APSC. Thanks for your time Falk. The present invention relates to an anti-shake apparatus for a photographing apparatus, and in particular to the movement of the movable unit to a position so that the shock caused by the impact between the movable unit and the point of contact which stops its movement is mitigated. Speaking not as a Pentaxian - I'm not one - I think Pentax might do something a little different. (Don't they always?) They may have a final user size target in mind of a Pentax MX, with a full frame sensor, but no mirror. I think they are going to try a squeeze play against Nikon/Canon, and avoid competing with Sony. The top half is in place: the 645D is available for little enough that any pro shooting landscapes (for instance) is going to consider buying one instead of spending 5-7k on a DSLR. The bottom half is, as you said, selling a full frame camera for $1800. Nikon/Canon dare not drop the price of one of their flagship models that low - nor are they prepared to release a mirrorless full frame camera of that size at all. Nikon is quite likely to release a smaller-than-micro 4/3rds camera, and nobody knows what Canon has up it's sleeves. If Pentax went mirrorless _only_ with full frame, all kinds of pros who've added a micro 4/3rds camera to their bag now could have an almost as compact FF camera to work with along side. Pentax could use FF mirrorless to prevent people from buying anything else but Pentax lenses to use on their "other" mirrorless system. This would dry up the supply of used lenses, and drive the sales of new lenses immediately. Plus, people's lens collections would gain value immediately. A win for everyone. In any case, they could still sell their mirrored APS-C cameras, particularly the candy-colored ones, to new users. The "new" users today are in many cases moms wanting good low-light pictures of their kids at home, and fast-frame-rate pictures at their kid's sporting events. This pool of users may grow to become interested in the mirrorless FF cameras, particularly when they compare the "classic" smaller size with their "full size" APS-C cameras. Thus they don't have to solve the problem of fast framerates combined with fast autofocus immediately. Besides mirrored APS-C cameras have a big advantage for some kinds of reportage work, so there's no reason for those users to move away from it. Will Frostmill, your plan is so cunning, you could stick a tail on it and call it a fox. Kinda off topic, but I saw you mention contrast based AF in a comment here. What do you think about the Fujifilm sensor that has phase detect AF built into it? A DSLR (or SLD) with that would be great IMO, AF for video and Live View as fast as for photography. Or being able to choose a slightly slower speed and not have such nervous AF action while filming. If Pentax does not release a FF DSLR in 2011, they will become yet another failed Olympus. Wanting to be in the Pro-segement, but failing in seeing that BIG SENSORS IN SMALL CAMERAS IS THE FUTURE, not small sensors in big cameras. For me the biggest or maybe the only reason for FF is better low light performance. I believe with future generation imaging sensors the need for FF will always decrease and maybe will not be reasonable anymore. I feel this aspect was not considered in previous discussions. Some month ago it was announced promising sensor technology "Quantum film" from InVisage. It got also Wall Street Journal 2010 Technology Innovation Award in the semiconductors category. Yes it is not production- ready technology, but also FF to be avialable for wider enthusiast segment is probably far away, because of its price. @Anonymous: Yes, that's the generally mentioned reason for FF. However and I must have missed to explain in my article, it is NOT the relevant reason for FF. btw, technological progress in this domain would affect all sensors alike. No, the real reason for FF is that high resolution imaging becomes feasible which it isn't with APSC (due to lack of various accuracies like focus, anti shake, lens defect etc.). See what digital MF can deliver and you see what I mean. And digital MF has no low light advantage (yet). I've been waiting for a full frame from Pentax since I caught the bug for photography. I don't see enough reason to upgrade my Kx to another apsc if I still lose viewing degrees on my wide lenses. Iso and noise is an issue but sensor realestate is vital. Pentax please pull the trigger on this one, you won't regret it! I think there are many people ready to jump ship from other manufacturers, but they won't do it if they have to settle for a crop factor.